As human beings, our relationship with nature can be, at times, just a little bit complicated. We are part of the natural eco-system of the planet, yet at the same time, we both want and need to stand somewhat apart from it. However, there’s something inside of us that wants to have nature as part of our living space, even if it’s only a touch here and there. A space without at least some plant-life can feel lifeless and stale, while even a single, colorful flower can bring a sense of life and optimism to a room. Like the people who live in them, the designs of our homes are constantly changing and our methods of incorporating plants into our spaces have to keep up with our evolving tastes. Today’s contemporary design aesthetic, defined by smooth, streamlined design and calm, neutral color palettes pairs beautifully with the bright greens of healthy leaves and the bold colors of blooming flowers--which break up the symmetry, to breathe life and color into tranquil color palettes. Luckily, dozens of contemporary designers, artists, and home decor brands are all coming up with beautiful new options for bringing plants into modern homes. So to help you get a little more green into your modern abode, we've rounded up eight modern planter options which will look at home even in the most sophisticated homes. Here is an excellent way to blend natural and manufactured aesthetics. 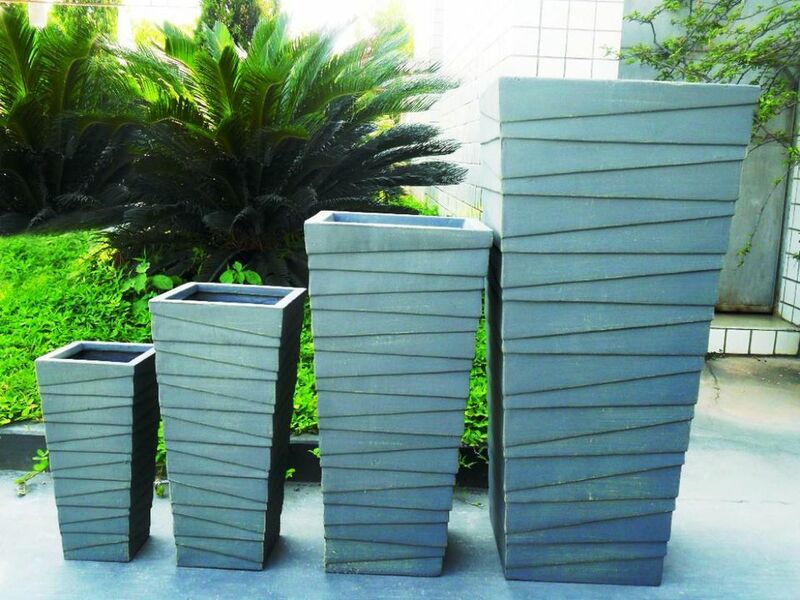 Try bringing in planters with a mix of heights, sizes, colors, and textures. The black, gray and white color palette of these planters, while very much classic, is also the epitome of design in the modern moment. Just because plants are one of the most classic of all indoor design elements is no reason why your plants should be presented in a classic fashion. In fact, the farther out of the box you can get, the better. Take this amazing geometric planter from Esty seller, White Lies Jewelry for example. Its intriguing vertical design puts a new spin on the tried and true square planter while bringing a little bit of height and a lot of visual interest to a small house plant. Even though we tend to relegate plants to out of the way areas like entryway table tops or small window sills, there’s plenty of other options that we can explore. Plants come in all shapes and sizes, so there are plenty of house plants that are big enough to make a big statement in your room. Once you’ve found the right specimen, you’ll need the right planter to put it in, and this large plant stand from West Elm need to be right at the top of your wish list. Big enough to command attention even sitting next to some of the larger furniture pieces in your room, these pieces have an eye-catching shape that is sure to add a pleasing sense of structure in your space. One way to bring a modern feel to a traditional potted plant is to pair it with an ultra-modern stand. These hairpin stands do just that by holding old-fashioned planters atop tall frames defined by thin, metal frames in geometric shapes. Stylish and slightly sci-fi, these stands will give any plant you care to call your own all of the modern style it deserves. The good people at Williams Sonoma are always thinking. And with this planter, they’ve thought of a way to let us turn our ordinary house plants into a serious wall installation. Add in as much color as you’d like or simply go green for a monochromatic look. Use one to create a small monument to nature in your favorite room or combine three or more for a wall-spanning exhibition. The job of a great modern planter is to bridge the gap between the rough-hewn lines of the natural world and the smoothly engineered precision that typifies contemporary design styles so that the plants you bring into your space don’t seem out of place. These planters do a wonderful job of merging these two worlds, combining curved organic-feeling plant bowls with straight bases with metal legs.